Place bread pieces in a bowl. Pour milk over bread; allow bread to soak for 1 minute. Squeeze excess moisture from the bread and place bread in a bowl; discard milk. Mix ground turkey, turkey Italian sausage, Parmesan cheese, parsley, garlic, salt, and pepper together in a bowl. Add soaked bread to turkey mixture and gently mix. 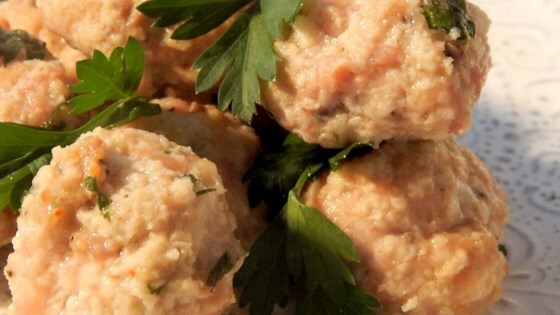 Form turkey mixture into 1 1/2-inch balls; place on the prepared baking sheet. Bake in the preheated oven until meatballs are cooked through, 20 to 25 minutes. An instant-read thermometer inserted into the center should read at least 165 degrees F (74 degrees C). The nutrition data for this recipe includes the full amount for the milk. The actual amount of the milk consumed will vary. We don't eat cheese, or anything made with cow's milk, so I substituted cashew milk to soak the bread and the juice of one lemon to replace the parm cheese. They were delicious!!!!!! Thank you. Delicious, when they were done baking I put them under the broiler on HI for a few minutes to make them a bit crispier! I definitely will make these again!